On the heels of Google launching Google Instant, Stanford student Feross Aboukhadijeh has created a similar tool for YouTube – YouTube Instant. 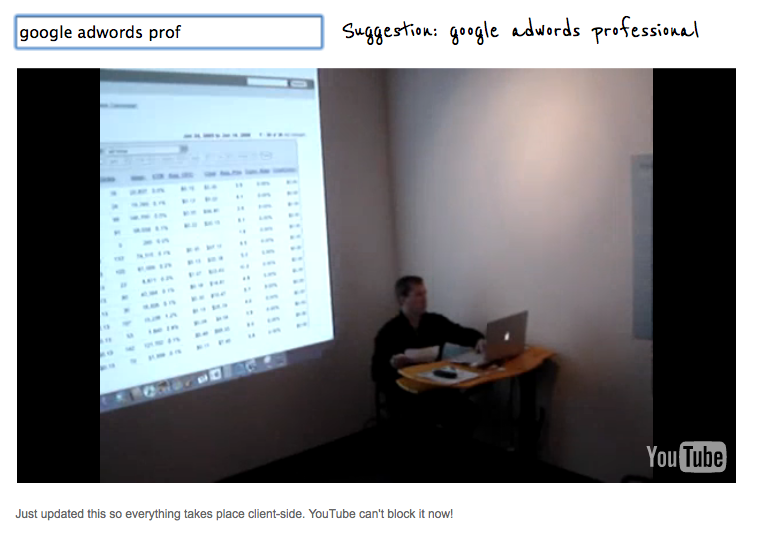 I gave it a try for the only term I know to show up as the first result for in YouTube – Google Adwords Professional. Sure enough, YouTube Instant search suggestions produced a video of yours truly under google adwords prof.
Great thinking and work Feross. This entry was posted on September 10, 2010 at 4:19 pm and is filed under Google Instant, YouTube Instant Search Suggestions. You can follow any responses to this entry through the RSS 2.0 feed. You can leave a response, or trackback from your own site.